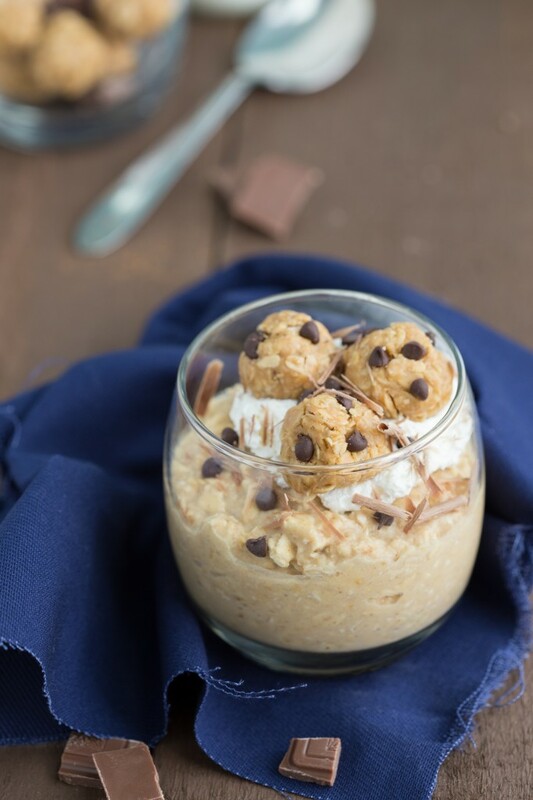 Chocolate-chip oatmeal cookie overnight oats with actual miniature no-bake cookies to top it off. The “cookies” are three-ingredients, very easy, and super healthy to make. This is the perfect on-the-go breakfast! Clearly, I am not messing around with my overnight oats. These ones have actual “cookies” in them, and the last batch had actual brownie mix in em. When I say dessert for breakfast, I’m completely serious. It’s my favorite way to do breakfast. 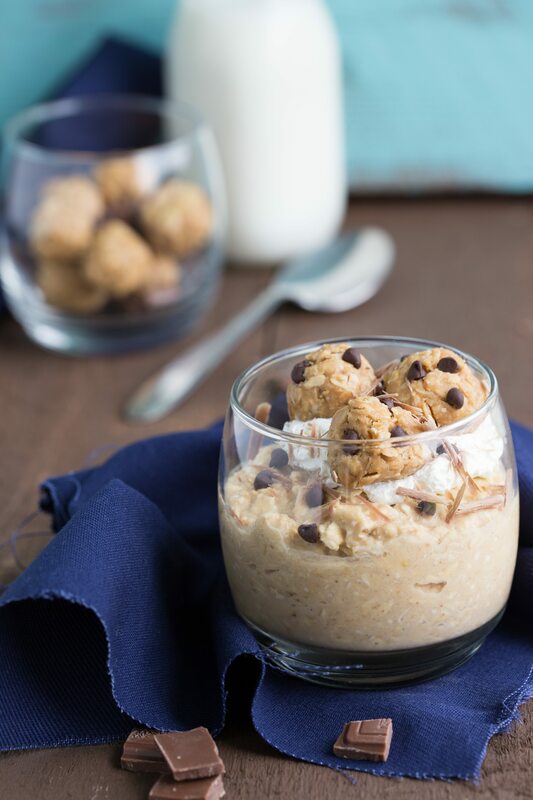 And since I have pretty much exhausted every single breakfast cookie – (no-bake and baked alike) possible, I’m bringing you cookies in overnight oatmeal form. But don’t worry about not having breakfast cookies, I’m sure they’ll make their rounds here again real soon. I’m hopelessly addicted to those. And these kind pretty much do have breakfast cookies in them – just in a simpler, 3-ingredient form. 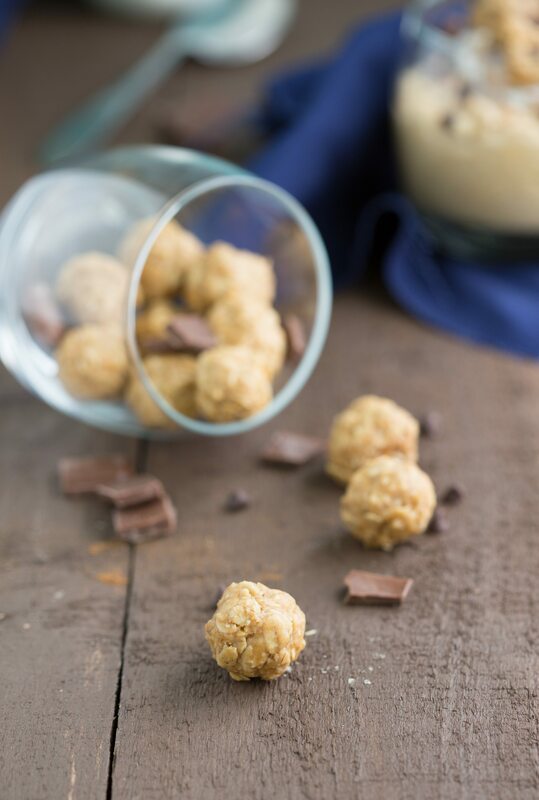 But feel free to substitute these no-bake cookies in this recipe instead. They are a family and reader favorite – and for good reason, they are SO easy to make and absolutely delicious. But since the whole point of overnight oats (at least to me) is a quick, throw-it-in-the-fridge, breakfast is ready in the morning type of deal — I wanted these to still be super easy. Which they are. 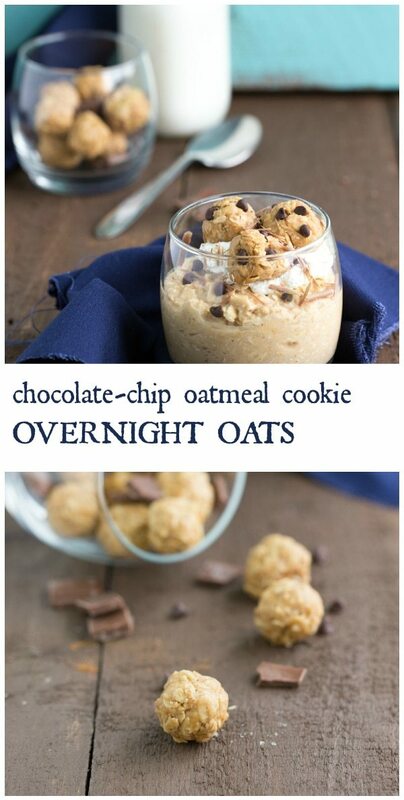 That’s the amazing-ness of overnight oats. I always feel so on top of things when I wake up and breakfast is already made. So I can write out my list of things to do for the day and immediately cross of making breakfast from the list. Overnight oats are pretty adaptable. I’ve been making them for several years now (hello college breakfast for four years straight) so I’ve got the quantities and ingredients exactly how I think they are best. But there is a lot of room for changing things up. You can switch the type of milk, up the peanut butter amount, increase the oats a bit (you’ll want more liquid too), and even put a higher ratio of chocolate chips to oats because heck I’ve done that too before. Also, I do know some people like to warm up their oats in the microwave. I personally love them cold, but whatever works for you. In a small bowl, combine the peanut butter, and vanilla extract. Microwave for 10 seconds, stir for 10 seconds, and microwave for 10 more seconds. Add in the yogurt, milk, oats, sweetener, salt, and cinnamon. Stir well and make sure the peanut butter is mashed in thoroughly. 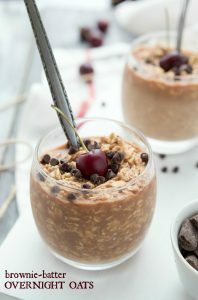 If desired, add in mini or dark chocolate chips and stir into the oats. Transfer the mixture into a small jar or sealed container. Place in the fridge for at least an hour or until oats are completely softened. Store overnight oats in the fridge for up to 3 days. For the "cookies" mix together the honey and peanut butter in a small bowl. Microwave for 20 seconds and stir well. Stir in the oats and oat flour (measure the oat flour AFTER blending the oats in a blender or food processor). The mixture will be thick and if it's not thick enough add additional oat flour. Mix in the miniature chocolate chips. Form small balls by squishing the mixture and then rolling into balls. You need to squish it tightly and roll them tightly to keep it together. This looks awesome Chelsea, and the cookies sound so easy and yummy I might just have to make some of those to eat for a healthier dessert! 😉 pinned! These oats look and sound amazing Chelsea! I got into oats this year (I KNOW – what did I do before this?!) and I love them so much!! 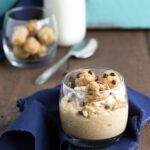 I usually add a dollop of nut butter to mine, but I’ve got to try adding this peanut butter oatmeal cookies! Pinning this beauty! Your overnight oats are amazing, Chelsea! I thought the last one you created was incredible, but this one looks just as good! Peanut butter and chocolate chips sound like the best breakfast combination. Pinned! Cookies for breakfast are an instant yes in my book. I LOVE the way your mind works!!! 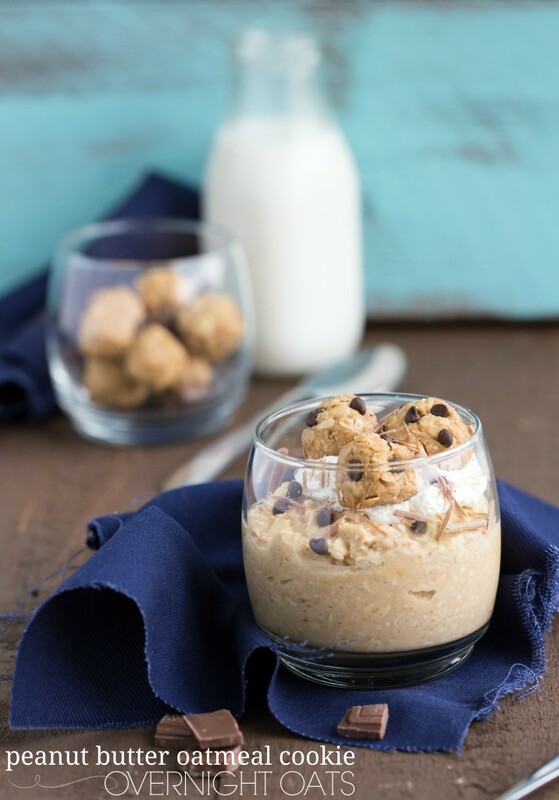 Those cookies-just too good by themselves and then these oats! !!! This looks so delicious! How yummy! Best breakfast ever. I must have this! Any excuse to eat cookies for breakfast. CHELSEA DID YOU JUST MAKE COOKIES FOR BREAKFAST A TOTALLY VIABLE OPTION?! You did. And it’s awesome. And I’m pinning it right now. Could you please tell me what the white stuff is, under the cookies, in your picture? Is it yogurt or (I hope I hope) whipped cream? Thank you for your amazing recipes! !